There are many products available for purchase for treating head lice. Many prescription shampoos contain pesticides (Lindane) and highly flammable alcohol (Malathion). Non-prescription shampoos and crème rinses contain insecticides and Ovide (Rid, Nix, A-200, Clear Lice Systems, Pronto). In addition to being dangerous, studies have documented that head lice is resistant to these shampoos and that they do not kill lice eggs. Bottom line, chemicals don’t work and are too dangerous to use on your children. 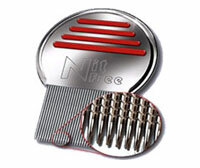 The Shiny Strands Nit-Comb is the ultimate tool to fight head lice and nits. Studies show the only real way to eliminate head lice is to comb and pick. This comb can be used alone or with any lice treatment product such as Nit-Free Two-in-One Shampoo or Nit-Free Mousse. 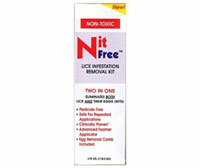 Nit-Free Two-In-One Shampoo is a non-toxic, pesticide free product proven to aid in the removal of nits and lice. This revolutionary, cleansing product uses a combination of naturally occurring enzymes to harmlessly stun insects without the risk associated with pesticide poisons. Use this product in conjunction with the Nit-Comb to treat at home. This product is intended for use on long-hair and older individuals. 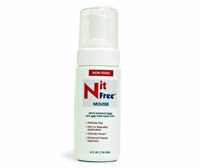 Nit-Free Mousse is a non-toxic, pesticide free product proven to aid in the removal of nits and lice. This revolutionary, cleansing product uses a combination of naturally occurring enzymes to harmlessly stun insects without the risk associated with pesticide poisons. Use this product in conjunction with the Nit-Comb to treat at home. This product is intended for use on short-hair & younger individuals. X-Pel Shampoo & Conditioner is clinically proven to stop itching caused by lice bites, eliminate and repel lice and ease egg removal. It leaves hair soft, shiny and manageable. 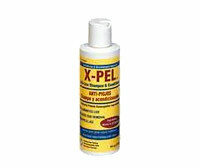 X-Pel is made with homeopathic ingredients. 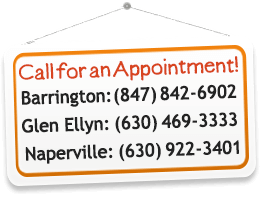 It should be used while you have lice or when you have come into contact with someone who has lice. Nit-Free Mint Spray is a “first of its kind” lice fighting tool using a specialized mint formula to help ward off head lice. The Mint Spray may be used as often as necessary without leaving an oily residue. It will leave a great mint scent that lice will find offensive. Nit-Free Shampoo is made with the highest quality natural and pesticide-free products and essential oils, including tea tree oil and peppermint oil. It is good for your hair and scalp while also fighting head lice. Nit-Free Shampoo is sulfate free and is ideal for children and adults who have sensitive scalps. This shampoo can be used every day to ward off head lice. Nit-Free Conditioner is a “first of its kind” natural conditioner that is good for your hair and scalp while also fighting lice. It is made with the highest quality natural ingredients and essential oils. The result is a sulfate free conditioner with detangling properties that wards off head lice. This conditioner can be used every day.